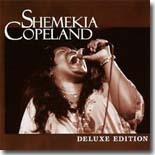 Young singing sensation Shemekia Copeland possesses one of the most mighty and distinguished voices on the global music scene today. Quite frankly, she is a master of the greatest instrument – the human voice. That voice is on display on the retrospective Deluxe Edition, recently released by Alligator Records. As a mainstay on the blues scene for her entire 15 year professional career, you may not recall the excitement when her ground breaking debut CD, Turn The Heat Up, stormed the charts in 1998. Copeland was the breath of fresh air the stagnated blues world needed then. She was hailed as a revolution and Messiah for the blues. Over the years, she has received eight Blues Music Awards, a horde of Living Blues Awards, headlined the Chicago Blues Festival, and has had numerous television and radio appearances. Born in Harlem, New York in 1979, Copeland began singing professionally at age 16, first opening shows for her father – the late Texas blues guitar legend Johnny Clyde Copeland – and then leading her own band. She signed with Alligator Records when she turned 18 and proceeded to make four albums for them. Copeland has struggled to find herself since departing Alligator after 2005’s The Soul Truth. It’s wonderful to hear the finest selections from the four CDs that spawned the biggest blues explosion in contemporary times. Her explosive vocals do not growl like Koko Taylor, but they sure can produce a full-throated roar. Miraculously, her vocals can sound sweet, mean, and tender – all at the same time. Copeland surrounds herself with musicians as adept as herself including Jimmy Vivino, Arthur Neilsen, and Brian Mitchell. How can she go wrong with songs written by Gary Nicholson, Jon Tiven, John Hahn, and herself? Copeland has been gifted with a remarkable talent for baring her soul via vocal expression. Experience it for yourself on her masterpiece the magnificent "Ghetto Child" (originally written, recorded, and performed by her father), which will send shivers down your back. Like a great actress, she takes on the role of the song’s protagonist. Here, angst and oppression culminate to spur the listener into a state of passionate empathy for the main character. It’s hard to comprehend the authoritative song was recorded when she was only 17 and still in high school. Spoken from the heart of a woman, the extremely emotional "Love Scene" is sung for women everywhere. Here, it is revealed that women need to be loved, appreciated, and respected. The song’s main message runs deep. It asserts it is better to experience real ardor than to pretend and simply go through the motions. A combination of funk, soul, and rock ‘n’ roll is heard on "Who Stole My Radio?" The captivating lyrics describe why most of us turned off the radio years ago. Quite purposely, the melody is extremely radio friendly. It’s ironic that someone responsible for making radio great (legendary Stax Records main man Steve Cropper) is on a song that depicts its demise. "Turn The Heat Up" is classic, comical, and dramatic. Throughout, stirring lyrics are used effectively. The song sounds retrospective (e.g., swinging horns) and contemporary (e.g., piercing guitar work) at the same time. Copeland won a Blues Music Award for her rocking anthem "It’s 2 A.M." It may well be the best blues/rock song of the 21st century to date. "Don’t Whisper" is a ballad that tears out your heart because it reflects reality. The song proclaims love should be proudly and openly displayed, not hidden away like someone with a shameful sickness. Here, Copeland’s affectionate voice acts as the conscience of a spineless lover. You will feel many emotions after listening to these 16 poignant songs. Throughout 67 riveting minutes, Shemekia Copeland refuses to be pigeonholed into one specific genre though fans and listeners tend to classify her as blues. Copeland dominated the better part of the 2000s and this CD confirms why. The only thing that would have made Deluxe Edition better is a previously unreleased song or two. If you don’t have any Ms. Copeland in your collection, this is all you’ll need (for now).